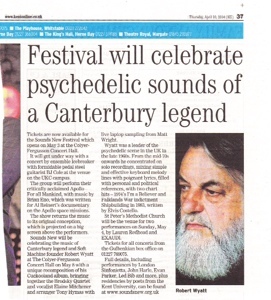 Delightmemt and excitement coursing through the corridors of Sounds New HQ at this feature in the local press on Thursday. Find out about all the events at Sounds New next month online here. This entry was posted on Saturday, April 12th, 2014 at 9:55 am and is filed under Events, Press. You can follow any responses to this entry through the RSS 2.0 feed. You can leave a response, or trackback from your own site.